Growing up isn’t easy. And for the young people we serve, many of whom have experienced poverty and trauma, it’s even harder. It’s no wonder that they often turn to alcohol, drugs or crime as a way to fit in or to numb their pain. But we believe that these youth can overcome their challenges and become the people God intended. In this issue, read how our Secure school helps kids in custody learn and grow. Then learn how we’re connecting our programs to serve youth better. It’s the middle of health class at Ray of Hope’s secure custody facility. Teacher Joel is presenting a slideshow on mindfulness. One of the students seems somewhat less than attentive; he’s reading a novel while the teacher tries to engage him. But Joel’s not frustrated. What some people might see as disrespectful behaviour, he sees as a success. The student is 17 and has never been able to earn a high school credit. Just being able to sit quietly in a classroom is a big step for him. And when later in the class, he begins to participate in the deep-breathing exercises Joel is teaching, it’s icing on the cake. For Joel and fellow teacher Don, these small wins are a daily highlight in what can sometimes be a challenging learning environment. Another hurdle is the fact that while some of the youth might be at Secure for the entire school year or longer, some are just passing through. That’s why, even though the school’s curriculum is the same as in any other Ontario high school, the delivery methods differ. The students are split into two groups. Joel teaches one group Phys Ed, which includes a variety of activities from Crossfit to basketball to health class. The other group, taught by Don, begins their academic session with an opening activity such as a riddle, a math problem or a debate on a current news item before settling down to individual study. “The activities help students get ready to learn and also helps build a classroom community,” Joel says. Half-way through the morning, the groups switch. And in the afternoon, the schedule repeats, except that students take construction technology with Joel instead of Phys Ed. 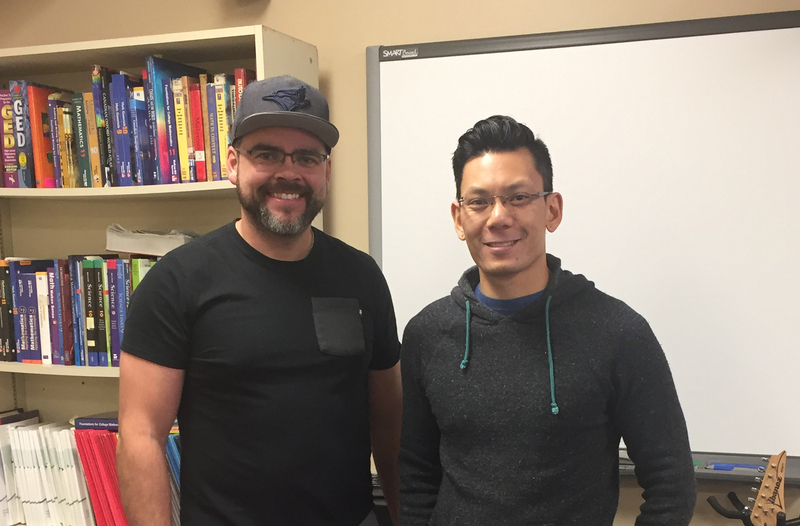 Even though youth may be at Secure for only a short time, Joel and Don make every effort to make students’ time in class productive. Teacher Joel (left) and Teacher Don in Secure’s classroom. What’s the best part of teaching at Secure? And while there are the small successes every day, there are some pretty big ones too. Joel remembers one student in particular. It was a bittersweet moment for Joel. “We did all this work together but we didn’t get to have the celebration,” he says, laughing at the memory. Bittersweet, that is, until Joel received a phone call from Chris, inviting him to the graduation ceremony. “To be included in this celebration of success, that was a special moment,” he says. Sometimes, Joel says, people don’t understand why he invests his time in kids in custody. “Most people respond to that. Especially the taxpayer part,” he says with a laugh. He becomes serious, but still cheerful, when speaking of his personal beliefs. * The student’s name has been changed. Are you a tradesperson who’d like to talk with youth about your job? Do you have a talent you’d like to share? If you’re interested in volunteering with Secure’s school program, please contact Joel at 519-634-8883. Between work on the LRT and water line replacement, ‘construction’ is a four-letter word in KW these days. Ray of Hope was impacted when the Region of Waterloo acquired our building at 1080 King Street East for the Ottawa street expansion. But what could have been a negative situation has turned into an opportunity for our youth programs. With the purchase of 1080 King, a new home was needed for our Alternative Education and Community Day Treatment programs, as well as Youth Addictions and Youth Reintegration staff. The search for suitable office space proved difficult as any new space needed to be on a bus route. “Most of the youth who use our services rely on public transit to get around the city,” says Dan Wideman, Ray of Hope’s Chief Operations Officer. The most affordable option turned out to be in the Ray of Hope main office building at 659 King Street East. But unfortunately, that meant that tenant Faith FM had to move. The 2,440 square feet on the upper level of 680 King will be converted into space for the Youth Addictions Day Treatment Program, as well as offices for staff. In addition, the former Better Business Bureau building at the rear of 680 King will house classrooms and offices for the Alternative Education and Youth Work Experience programs. Downstairs, a program space with a full kitchen will be available for life skills training. Bringing the different programs into closer proximity will make serving participants much easier, Dan notes. Having a program hub means it’s easier for participants to transition from one program to another, both physically and emotionally. They’ll come to know staff in other programs through day-to-day interactions. At the same time, they’ll continue to have the support of staff whom they’ve come to trust in their current program. When it comes time to transfer, “staff from one program can walk over with the youth, they can all sit down together and talk about the transition,” Dan says. And for young people who’ve regularly experienced upheaval in their lives, that consistency and connection can make all the difference. Renovations on the former BBB building have already started and work in the main building will begin as soon as permits are approved. The move to the new space is scheduled for February. We are very grateful for God’s faithfulness over the past 50 years! 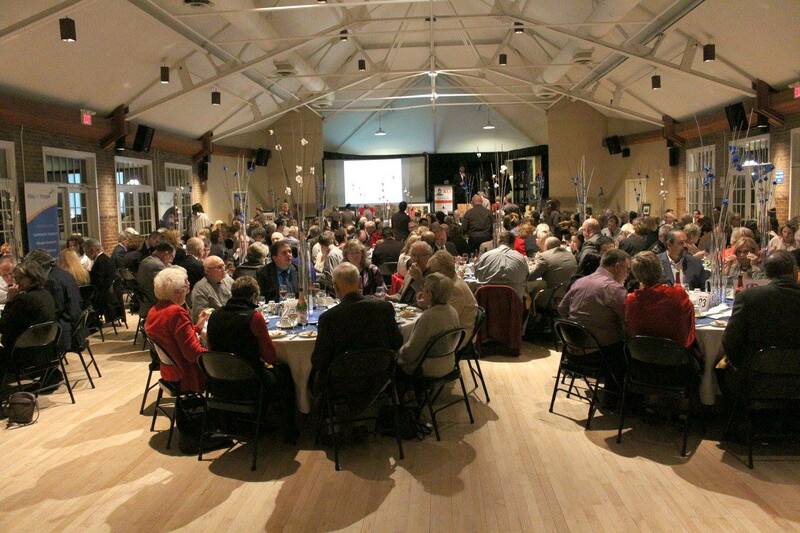 See photos from the 50th Anniversary Gala on our Facebook page.